The attendant console easily attaches to a SPA500 Series IP Phone, providing up to 30 programmable call pickup or speed dial buttons via two page keys, each illuminating the line's status (idle, ringing, busy, or null) via the busy line field (BLF). Incoming calls can immediately be transferred to the proper location with the push of a button assigned to the extension. 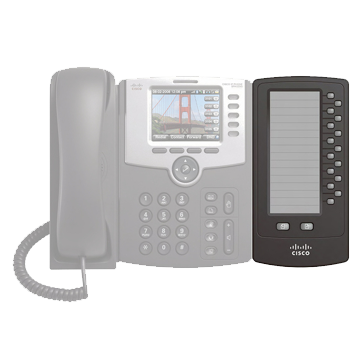 Up to two of the Cisco SPA500DS modules can be connected together, for a total of 30 buttons (60 functions), offering an affordable solution ideal for receptionists easily allowing them to manage calls. Installation and setup is just a matter of connecting the supplied bracket and cable to the attendant console, which uses the phone's power supply; no additional power source is required.